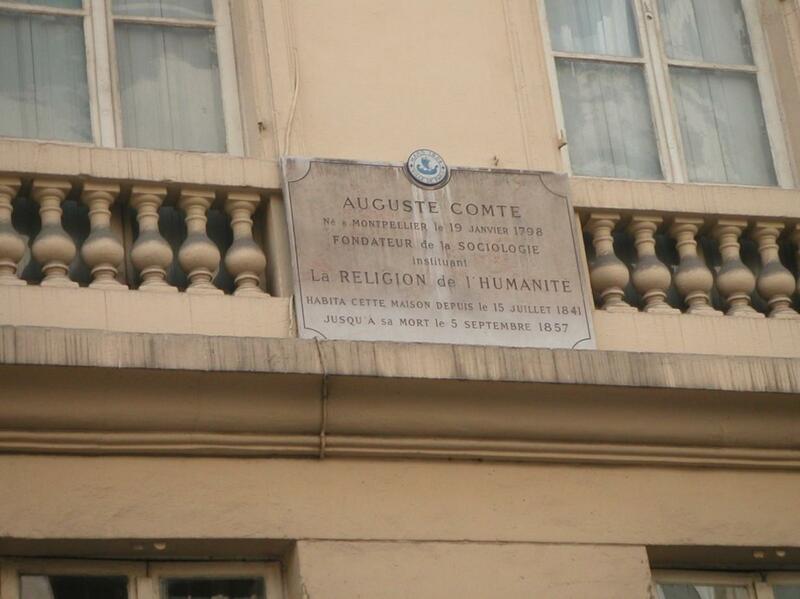 Auguste Comte (1798-1857) is known to historians of science for his role in founding the science of sociology, the philosophy of positivism, and the religion of humanity. 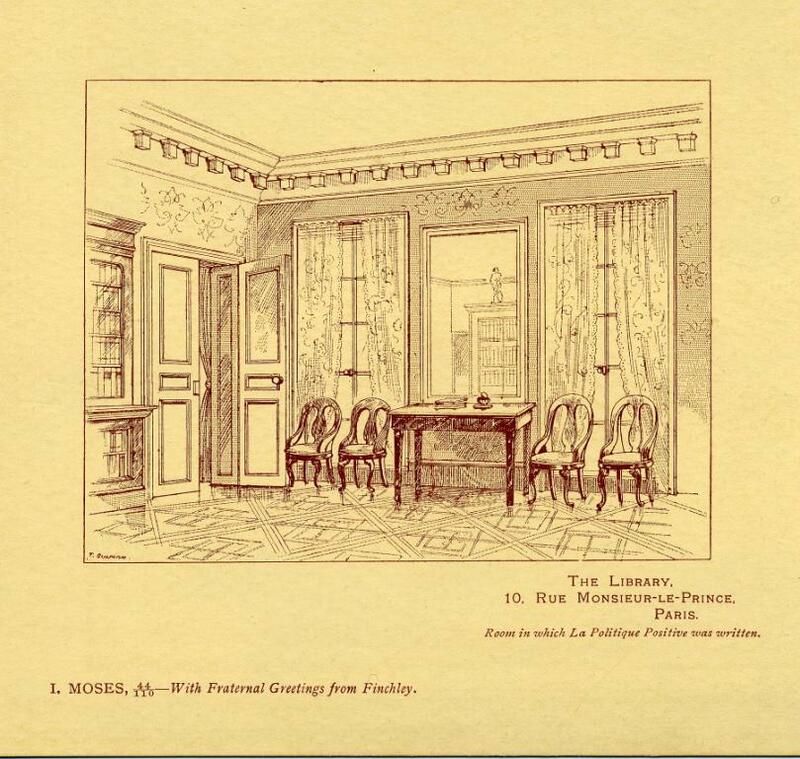 For sixteen years, from 1841 until his death in 1857, Comte lived in a relatively modest apartment at 10 Rue Monsieur-le-Prince in Paris, where he composed works on philosophy, sociology, politics and religion. Modern-day visitors who retrace the steps of intellectual pilgrims who visited the eccentric French sage during his lifetime will find a museum, library and archive devoted to the man and his work. 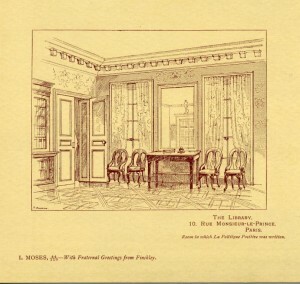 Comte’s living quarters are preserved and, for those wishing to make a more scholarly visit, the library and archive are extremely well stocked with books, periodicals and other printed materials relating to all aspects of positivist thought and activities in France, England and further afield. During a visit to Paris in 1865, some years after Comte’s death, George Eliot and G. H. Lewes thought the great positivist’s former home the most interesting thing they saw. Eliot wrote to a friend: ‘We thought the apartment very freundlich, and I flattered myself that I could have written better in the little study there than in my own.’ In the 1890s, the artist Thomas Sulman and his wife sent new year cards to their fellow English positivists, offering ‘Fraternal Greetings from Finchley’, which bore an image of the library in Comte’s apartment, with the caption ‘Room in which La Politique Positive was written’. Truly devoted Comteans today can visit not only the Maison d’Auguste Comte, but also a surviving Chapel of Humanity at 5 Rue Payenne; Comte’s grave at the Père Lachaise cemetery (including a monument erected by Brazilian positivists in 1983); a statue of Comte at the Place de la Sorbonne; and the Rue Clotilde de Vaux, named after the woman who was the inspiration for Comte’s Religion of Humanity and its associated ideal of altruism. 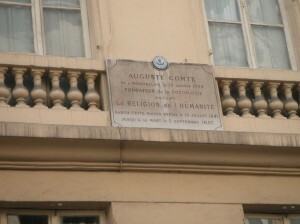 There is an informative article on Auguste Comte at the Stanford Encyclopedia of Philosophy and more information on Comtean locations in Paris at the ‘Invisible Paris’ blog. This entry was posted in Europe, France and tagged comte, paris, philosophy, residence by Thomas Dixon. Bookmark the permalink. Dr Thomas Dixon is currently Senior Lecturer in History at Queen Mary, University of London.